This page describes how your development team can start using the Bamboo continuous integration server to get rapid feedback on your .NET project. You may want to read Understanding the Bamboo CI Server first. Bamboo installed and running. See Installing and upgrading for details. You'll want user accounts in Bamboo for each member of your team. Source code under version control. Each team member will have access to the repository. Tests, as part of the source code for the project. A command that builds the code and executes the tests. Connects to the repository and checks out the source code. Runs the unit and integration tests. Bamboo provides feedback on the test results. How do we achieve this with Bamboo? Well, we'll create a new Bamboo plan that knows how to check out and build our source code, and then report on our test results. 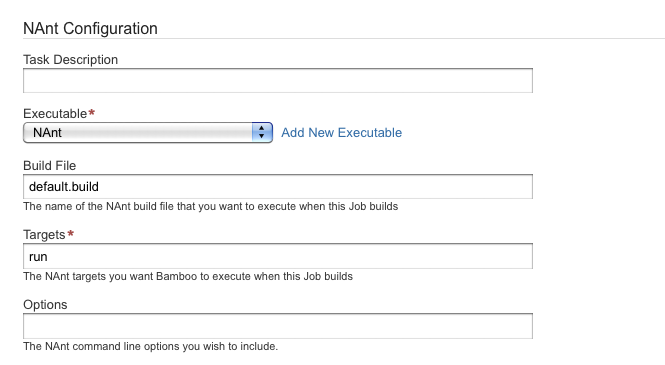 A Bamboo plan is where you define the details of your continuous integration workflow. A plan allows us to specify a source code repository, when Bamboo gets triggered to run the build, and how Bamboo should provide feedback on the test results. Click Create Plan in the menu bar, and then Create a New Plan. See Configuring plans for details. Bamboo needs to know where the source code repository is located, and needs access to the repo so that it can check out the code when it runs a build. Choose the repository type from Source Repository, and provide access details such as username and password. See Linking to source code repositories for details. We can choose how Bamboo gets triggered to run the plan build. We want Bamboo to build the project whenever code is checked into the repository. Choose Trigger type > Repository triggers the build..., and optionally, specify an IP address for the repository server. See Triggering builds for details. Each plan needs to have one or more tasks specified. Tasks do the real work of the plan. We also want to compile the code. We'll add a builder task to the Bamboo plan to do that. We assume that your project already has a build process set up that Bamboo can call upon. See http://msdn.microsoft.com/en-us/library/ms171452%28v=vs.90%29.aspx for information about MSBuild. See http://nant.sourceforge.net/ for information about NAnt. See http://www.microsoft.com/visualstudio for information about Visual Studio. 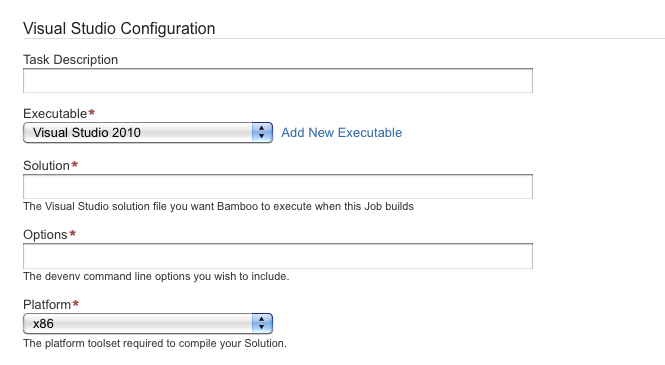 Note that a build tool needs to be installed on the Bamboo server machine before you can use the Bamboo task. See Configuring a builder task for details. Now we want to run the unit and integration tests, and display the results from those. You need to set up one of the MSTest, NUnit or MBUnit tasks so Bamboo can get and display the test results. You can specify a custom results location if your project directory doesn't use the conventional structure. See Configuring a test task for details. You should see the plan run. The 'Plan Summary' tab will report whether the build succeeded or not.